I had, like, all of those pocket box games. That Car Wars was my introduction to the entire hobby of gaming. And Undead is actually a really fascinating game. It kind of awkwardly requires a sort of GM to administer between two teams (Dracula and the hunters). So unlike Descent or whatever other one-vs-many games, the GM doesn’t exactly get to do much. He just knows each side’s secrets, like where they are hiding for the day/night, so that when the two sides encounter each other, they know. Fury of Dracula is definitely a more polished version of a similar idea, but there’s a lot that’s more intimate and detailed than Fury in the game Undead. I’ve done a lot of Kickstarters over the years. It’s the first time I’ve ever seen something like that before, like trying to guilt someone into not asking for a replacement for their part. The thing is, especially with board games, if their packaging isn’t good, something is breaking often because of how it’s in the box, they should want to know that for any reprints or retail shipping. Even if someone were to glue one of the minis, it seems ideal they be aware they have a weak spot and the packaging is inadequate. 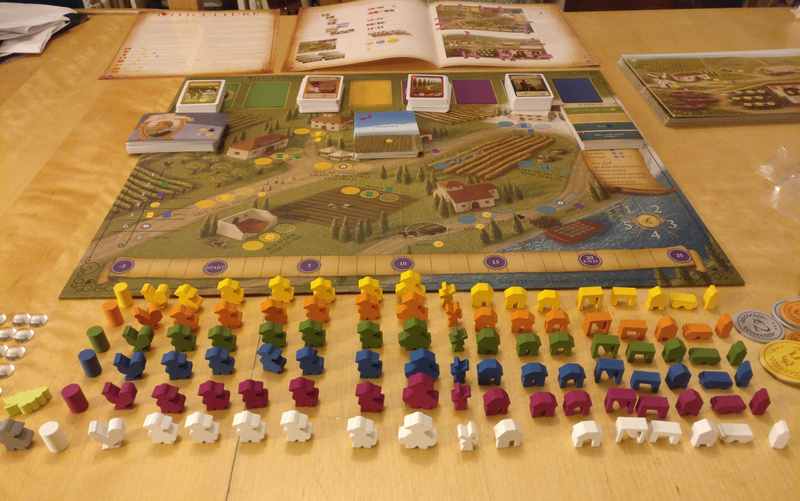 This conversation was brought back to mind because I received my copy of Viticulture Essential Edition yesterday (I’ve fancied trying it for quite some time and it just came back in stock). I started playing solo to get my head round the rules (that version comes with a neat automata system to play solo) and noticed that my player colour was missing a single meeple. To replace or not to replace: It’s important to us that you get the full and best version of your game, and we will respond to any requests for replacement parts. That said, we ask for your compassion and understanding if certain types of tokens are missing or broken. For example, in Euphoria, 1 missing water token out of 18 isn’t going to impact the game, and it is quite expensive to send even a small token to international backers. On the other hand, you need exactly 10 authority tokens and 4 dice per player—if any of them are missing, definitely let us know right away so we can replace them at no cost to you. It’s phrased differently, but the sentiment is similar. Those companies aren’t huge publishers and it’s not unfair for them to ask for some consideration before you ask them to get something replaced. That said, as far as I know, both companies will still happily replace your damaged components to ensure you enjoy your games. Personally, I don’t see it as condescending or bad customer service. Those of you who took part in the most recent livestream will remember us saying that giving solo mode the diligence it deserves is a big deal for us, and the funding level we’ve associated it with was chosen accordingly, but we believe this community will have no problem reaching that level of success and unlocking this content! The call has gone out - time for us all to rise up and answer! We’ve been elated as we’ve watched the joyous reactions pour in all day and are right there with you. The more we thought about building an adventure mode for this game, compared notes, debated ideas; the more we realized just how primed for a solo experience this big modular sandbox-y game really is and we could not possibly be more excited for what it has become and what it is adding to the Leaders & Alliances experience! The reason that goal is so high is because they expect quite a bit of work to have to go into making a satisfying and challenging solo mode for the game. It wasn’t designed that way, but the community has been clamouring for it and has been submitting ideas. They want to make it happen. I’m in regardless as I almost never play solo. Viticulture yesterday was an exception, and I was pleasantly surprised at the configurable challenge offered by the solo experience which, I think, was originally introduced in the Tuscany expansion. So who knows, I might even give it a try if Vindication comes with one. How many times have you seen that? Gloomhaven and Gloomhaven founders not only didn’t send a response like that, he sent you to a form where you could actually select through drop downs and visual aids exactly what you were missing. One of the first things I do when I receive a new game is check the components. If there is one missing, I will ask for a replacement. If they are not willing to give one, I will return it to the store and tell them it’s incomplete. Vindication, original KS release, has poor packaging. My expansion wasn’t even in the box. It was shrink wrapped around the outside the box and doesn’t fit in the box very well either. The customer is not asking for something they didn’t already pay for. In addition, the Kickstarter gave them money in the hopes, in good faith, that an item would be delivered and they have so little faith in the Kickstarter which gave them money based on little more than a good marketing effort that they’re going to require proof of damage? I think that is the wrong approach from a group that wants to rely on the same customers for future efforts. They were given faith, perhaps they should return an ounce of it. This hits so many of my nostalgia buttons but… I don’t think I could ever go back to CarWars. The incredible flexibility of vehicle creation was tons of fun for young me but the actual play was glacial. Maybe some of these other titles have aged better? No telling how good it will be yet, but they set the goal high to give themselves the resources to design and play test it with the community. I wasn’t that interested in solo play for my boardgames, but have been surprised how much I’ve been enjoying Viticulture, as mentioned above, and some Arkham Horror Card Game. So now I’m looking forward to this one, as it seems the kind of game I won’t be able to play as often with more casual gamers in the family. I’ve tried to take it out multiple times myself, no success yet. I got a good feeling about the next game night though. I’m looking forward to your impressions if it his the table. I was impressed by the quality of the components outside the plastic that covers the play trays. that’s pretty cheap stuff there. I can foresee replacing that, eventually. These don’t sit quite right, at least not on my version. Anyone up for yet more Aeon’s End content? This expansion introduces an infinitely replayable Expedition Mode which builds on the existing Aeon’s End lore. It also includes all new mages, nemeses, as well as gems, relics, and spells that are compatible with all existing content. 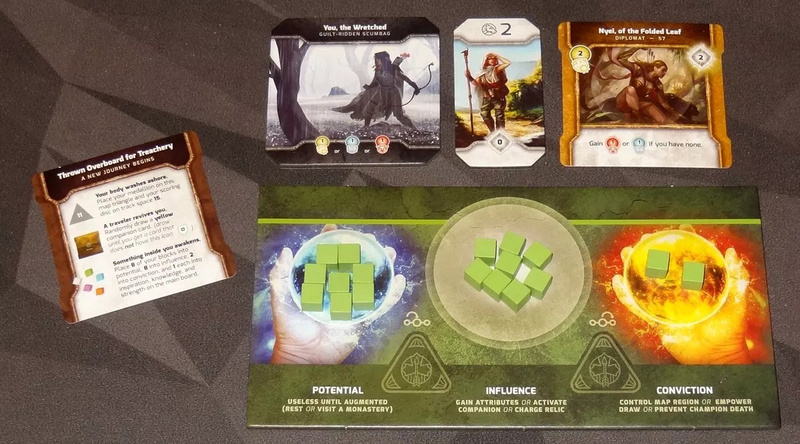 Aeon’s End: The New Age is a standalone expansion that can be mixed and matched with the other standalone games. We got to play last night! I was so excited. We have a handful of other games I was given to crack open but hey this made the list. I am going start buy saying that I believe the instructions are supremely bad. There is just something about the way it approaches the entire idea that does’t fully work, you wind up consulting the instructions a lot and then just going to Google. It was an overall very fun and exciting (yes it got tense at the end) experience despite some of the unnecessarily early stumbling due to the way they organized this game. The base board is two sided, one is a beginners side that helps with game set-up The dice, there are only two and they’re huge, are nice to look at but don’t worry too much about the random nature of it. It does introduce some random risk but it does not substitute strategy. Quick reference. Hand them out, use them… encourage people to read them. I kept encouraging one person to stop trying to memorize and struggle with ideas and just read it, and by the end she was one of the ones contended for first place and very excited, totally over that confusion hurdle. I could go on and on about the components, but they’re good. I had one mini with a piece broken off and so far all the rest seem fine. This is where the game stumbles the most, and a group could get bogged down by it. The way it describes augmenting powers (basically taking your colored bogs and moving it from one circle to another going left to right), is confusing. The middle circle, Influence, is what you use throughout the most of the game. The far left is useless, you don’t want blocks in there, and the far right is rare but really gives you a leg up with either the ability to do action, like control a part of the map, or do something better. This is also just regular influence whereas specialized influence allows you to do specific actions. You convert regular influence into specialized in a way that is basically a pretty color wheel… red (strength) and blue (knowledge) combine to make vision (purple). This whole idea of influence as a basically something you earn and spend and get back is centric to the game. This is also how you wind up with a lot of people doing different and interesting things all with the same goal in mind, trying to get as much honor as possible. You might have person A loading upon strength companions, building up courage and he’s diving into the Gaping Maw to destroy monsters which defeating gives him honor but also bonus ways to get more honor at end game. oh no, he rolled poorly and lost a hero but he’s still going in there. Person D really liked the Relic the other person got and is now two Relics in. Instead of using her precious Conviction to buy as much as the maps as others did, she’s using it to choose from 4 cards instead of the face up one or the blind hidden one to focus her efforts. The kind of neat characteristic of the game is how it’s not hugely difficult it is to keep track of all of this, an dhow genuinely curious / interested you are when someone uses that companion that basically can’t get killed by a monster, or the one that gives you an extra turn. Because the cards are unique, the Index pages are great at showing you what is available so you don’t have to guess which pile has the best chance of helping you with your specific strategy. Unfortunately the Index pages don’t help with clarifying as much as I hoped it would. I’ve got a feeling we used some of our cards incorrectly, but the second time around, and they made it clear there will be 2nd, 3rd and more playing, it will be a group decision on those and/or forums confirmation. So complicated to start, very, very long but worth it for 5 players, 3-4 might be a sweeter spot but mostly for time not complications, and maybe some space considerations. You really don’t hide much, and the favored cards are well known by the end of the night. We only played with one minor expansion this time, the treachery one. I sure hope so. If only they came back with those of us who let them know it was an issue that they were planning on working on it. Apparently my board has a slight dent in it. I won’t be asking for a replacement board though. It’s barely noticeable. Heck i didn’t notice it until it was pointed out but a lot of pieces were just plastic wrapped outside the box, and t’s a slight challenge to get it into the box (mine has the expansions). Many thanks for the in depth and informative after action report on your first game. I love that, even with the rules uncertainty and confusion, each player managed to go for their own distinct strategy and all had a good time. It’s always a good sign when people want to play the game again when they finish. You’ve got a good chance of it hitting the table again. Thanks for the warning. Nowadays, it’s rare I start playing a new game or even reading the manual before I’ve watched a how to play video to give me a rough idea of what I’m about to learn and allow myself to catch more details from the manual. You’re probably right about the videos. I just hate doing that. I don’t enjoy watching 20+ min set-up and play video in order to learn board games. These creators, especially the KS ones, could spend some of those resources designed ultra fragile and special looking minis and maybe just tighten up the the manual that tells people how to play. It also doesn’t help that early on you can see where some at that company didn’t even agree, initially, how what you’re supposed to do. I like the combination of the digging through the mountain through Tetris like pieces and the cascading resource gathering. I held off on joining until just yesterday because I still have so many of these from back in the day, but they’ve unlocked so many goodies that, well, I jumped in at the $200 level so I could grab a whole bunch of them. I’m an easy mark for Steve Jackson, what can I say. Dead Matter, has been delayed once again. Now they are putting the release of the Alpha at “summer” but they refuse to be specific. The KS began July 2017, offered the closed Alpha in 6 months. Nov 2017 they stated they needed another year. March 2019 they now say “summer” (purposely unspecific). KS originally raised over $210K after asking for $45K. Continuous Indie GoGo has raised almost an additional $300K. In two weeks, two former Raven devs will be launching a Kickstarter for their promising retro shooter Prodeus. I haven’t backed anything for years, but I’m keen to support the indie FPS movement. The campaign’s live. Prodeus has already reached a 5th of the funding goal so it’s off to a decent start! Prodeus is the first person shooter of old, re-imagined using modern rendering techniques. Oh, and tons of blood, gore, and secrets.